Activated carbon is a porous substance derived from organic material. For centuries, Japanese artisans burned plant matter to yield activated charcoal, renowned for its purifying properties. With the right equipment, you can easily make a zero-waste version of this versatile, natural product, applying its restorative properties to everything from soap to makeup and deodorizers. Select a dry, fibrous substance with plentiful pores. I chose peach pits because they're in season. Fruit peels, nut shells, and husks are also good options. Traditional charcoal is derived from oak branches and other hardwoods. Pack material tightly in a small metal container (an old tiffin works nicely). Seal loosely or use a lid with a small ventilation hole in it. Place on an outdoor fire source to ensure adequate ventilation. Allow at least four hours for a proper char. Leave peach pits a little longer. Remove container from heat source and cool completely before opening. Use lemon juice to increase preliminary pore size. A good rule for measuring is two juiced lemons per peach pit. Mix one part lemon juice to four parts water. Add solution to container, completely submerging the charred material. Drain container and rinse organic material of solution. Return to container and bake in oven at 120 degrees Celsius, at least three hours. Alternately, return to fire source for further refinement. Try incorporating a few pinches of activated charcoal in your favorite olive oil soap, tooth powder, or facial mask. I switched to activated charcoal cosmetics awhile ago and I like them. Ophthalmologists may roll their eyes when I say this but I've been using homemade peach pit carbon as eyeliner a long time and it seems non-irritating and safe. Most people mix the carbon with coconut oil, which I prefer. I can't find bulk coconut oil in Paris, so I used avocado oil for the eyeliner pictured here (I've even tried olive oil). Add 1/2 teaspoon activated charcoal to two teaspoons coconut or jojoba oil and four teaspoons aloe vera. It takes me forever to finish eyeliner, so I make very small batches, 0.10 grams or so at a time, to ensure freshness. Reduce oil to one teaspoon and add 1 1/2 teaspoons melted carnuba wax for volumizing homemade mascara. Thank you for this in-depth tutorial. I had not ever thought of making my own activated charcoal - it is good to know that i can! Thank you so much for this tutorial. I'm trying to go zero waste, but bulk options are few and far between in my town. Your blog is seriously inspiring, I can't wait to see more of your apartment. Quick question though, and it might be a dumb one, does this have to go directly in a fire, or would this work if it were placed on the grate of my BBQ? Hi Emilie! Thank you so much! I'm sorry I'm not sure of the answer, but I imagine it would be okay since you can make charcoal in the smoker! Don't quote me... but as long as it's a hot enough heat source it should work. I have a problem. I use store bought activated charcoal (made from coconut shells) and when I do mix it with coconut oil (2:1), the results are good, but they don't last long. I mean, it is barely water proof. Hi Sonaa, after doing some research and experimentation, it seems adding a pinch of xanthan gum and using half sweet almond oil and half coconut oil helps the eyeliner stick. This combination will need a makeup remover- it stayed on during a swim. I'm really interested in doing my own activated charcoal since the one I buy comes with non-recyclable packaging. 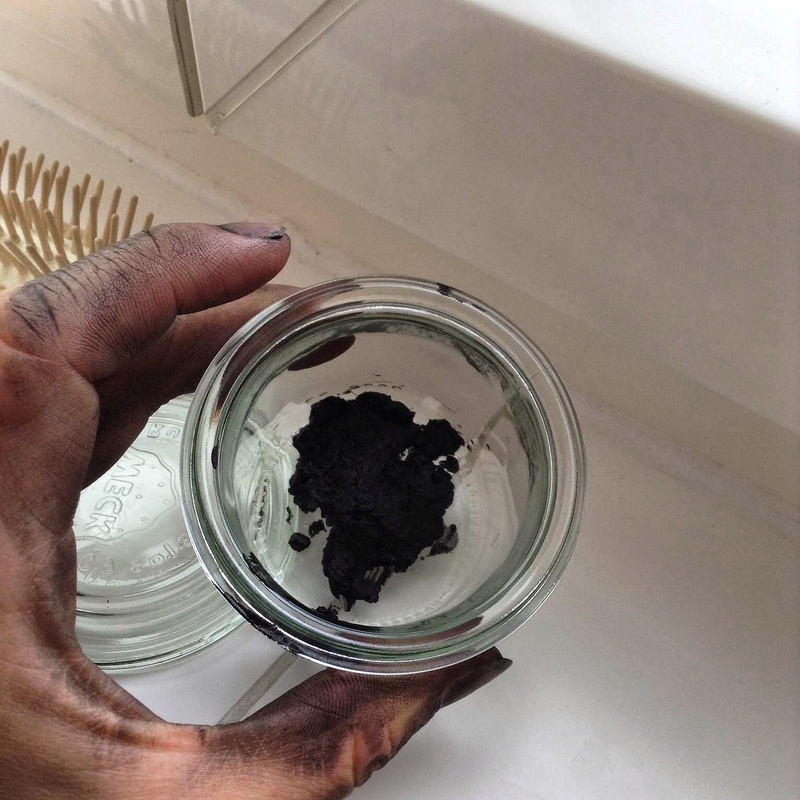 Would you recommend using a home-made charcoal to purify tap water? Hi Pauline! You are so sweet :) and conscientious! To be honest I've never tried it for water purification but many survivalist use homemade activated charcoal to purify drinking water in a pinch. As I'm sure you've already seen, there's a lot of conflicting information online about chemicals used to create industrially processed activated charcoal. Some recommend the homemade stuff to have more control over the process. Others say homemade activated carbon doesn't remove enough chlorine from city water. I guess the factors to consider would be- what is the activated charcoal you're using treated with? And what are the impurities you're looking to remove from your water? I personally think it's ok to keep using the activated charcoal you're already using. There are other ways to reduce waste and making charcoal at home, while easy, is truthfully very tedious. I probably should have written that in the post. Some might disagree, but I think it's perfectly reasonable to accept a little packaging in the absence of better options because your time is a valuable resource too. Sorry that was a roundabout way of answering. I hope it helps a little ? Thank you so much for your answer. I must admit that you raised a question that I never thought of before! It seems that the activated charcoal I buy (the one from Black+Blum) is clean, but I'll do further research. It's so cool that you're doing this. Please let me know how it turns out. Your binchotan is much higher quality than the one I made but they used a much hotter heat source. And it has lots of small pores to soak up chemicals, so it's really good for purifying water. I'm not sure I ready to purchase a kiln... yet... ahah. I just got an answer from Black+Blum. They say that "The charcoal is made in the most traditional way - the tree branches are cut down and put in a cauldron. This is then set alight and let to burn slowly and consistently. There are no chemicals involved in this and the ash is produced by burning the tree branches themselves i.e. some of it turns to ash, the core of the branch becomes the charcoal itself." Good to know! They replied fast! That's so interesting! I want to try it with a tree branch... just have to find a cauldron though. I'd like to write them and ask if they would reconsider the packaging. hello Ariana, i have read the post n number of times, but still didnot get the exact process. can u tell me pls clearly.. activated charcoal means, burnt wood ?